Towards the end of the Australian summer (which is still going in some parts) singer-songwriter Christie Lamb released ‘Hot Hot Kiss’, the first single from her third album, which will be released later this year. I spoke to Christie about the song, her writing process, and her big tour news for 2019. The new single, ‘Hot Hot Kiss’, is fantastic, upbeat, catchy. It’s still in my brain after listening to it. It sounds like you had fun recording it. I did. I think with the new album that’s going to come out – this is just the first single off the third album I’ll be doing – I wanted to mix things up a little bit. So we’ve started working with a new producer. It’s all going to be recorded organically in the room with all the musicians at the same time, which is a different experience to how I’ve recorded my last couple of albums. And I think the further along with songwriting you go the bit more personal you can get as well. So this album’s going to be a bit more heartfelt and not so much about other people’s lives. It’s going to be a bit more about mine and some personal stories to share. Does it feel confronting or a bit nerve-wracking to write more about yourself? Like you’re about to reveal things to a whole lot of people? I know that’s your job as a songwriter, to an extent, but still I think it takes a bit of courage to do it. Oh, definitely. I had a little four-track EP out first and then I’ve had two albums, so now I’m at the third album it’s only just feeling like the right time for me to do that now. Because you’ve got to establish yourself – what kind of sound you like, you’re still getting to know your fans at that time as well. So now, third album in, I feel like we’re all a bit more settled, whether it’s me with my sound, whether it’s the fans, they know me a bit more and therefore they want to go onto a deeper level and get to know even more about me. So I feel like now’s the right time, but it’s still daunting. 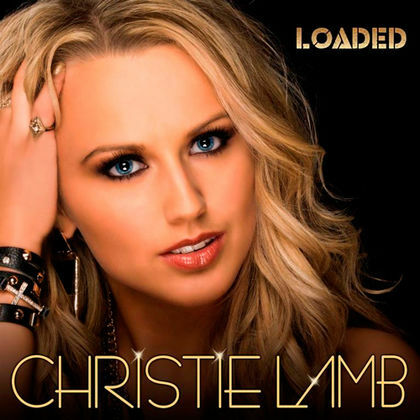 Australian singer-songwriter Christie Lamb released her second album, Loaded, earlier this year, and it seems as though she has packed every day since with achievements. I had a chat to her recently about the song and its video, as well as her recent trip to Nashville and a lovely highlight for her year. How long were you in Nashville? Five weeks, it ended up being. It was a pretty lengthy trip, doing lots of songwriting. I think I came back with about thirty-five songs, so it was pretty busy. Do you arrive and go straight to work? Is it set up as appointments with co-writers every day? How does it work? I went from the 17th of July to the 20thof August but I started booking in the songwriting sessions probably from end of March, start of April. Sending out emails – These are the dates that I’m here, I’d love to write – can we get a couple of sessions in? Or if it was a new writer, just trying to get the one session with them, see how we worked together. So it was pretty crazy and some people booked that far in advance and some didn’t, so there was less to choose from and it was hard trying to fit those in at the end. But it worked out quite well. There was a couple of days when we were doing double-writes a day, particularly towards the end of the trip when we were just trying to make extra sessions fit in. But it was great. Èvery writer over there was great to work with – we didn’t have anyone we couldn’t get a song out of [laughs]. It was very productive. But then on the weekends we had some time off. What happens if you get to the end of a session, and it’s your last session with that person, and the song’s kind of hanging? Do you go away and finish it? I think I’ve got one song like that, that I have to just tidy up a little bit. We’ve got the first verse and the chorus – it’s the second-verse curse, we call it. You get to the second verse and go, ‘Now, what have I got left?’ So there’s only one song that I’ve got to finish up and agree to what the exact lines are for the second verse, but we’ve got the bridge and the chorus and the first verse, and we’ve got the melody for all of it, it’s just lyrics. So the fact that we all know how that melody goes, and how it’s going to be phrased and how many words have to fit, it just means we can send each other an email back and forth to finish off those lyrics. But it’s not very likely that that does happen. Some of the songwriting sessions it depends how busy the writers are. Generally you get three hours to write a song. Sometimes, particularly if it’s an afternoon, we’ve gone four hours and we make sure we get it done. Sometimes that extra hour can help with those little tweaks and getting the song together structurally. When you go into that structured songwriting do you find it easy to switch on to that mindset of now you’re writing a song, or does it take a little bit of preparation? There’s a bit of everything. Basically from when I start sending out those emails and trying to book in appointments, I’m trying to jog my brain into just writing down, whether it’s a title or just a few random lines for a song. I go there with what I call the red folder – it’s a basic plastic red folder. But everyone says, ‘What’s in your red folder today?’ because they all know about those folder of random scribbles and titles. I flip through the pages and shout out a few titles or some lyric lines and see what jumps at them. Because sometimes you might be feeling like writing a particular song but your co-writers don’t click with that idea, so you have to have multiple ideas when you go in there. So it did take that preparation to get that red folder ready. And then as you’re there – particularly as I was there for so long – I had to try to block out what I’d just written, go into another session fresh, and just keep blocking them out so I didn’t keep writing the same song. But then at night I’d think, Okay, what have I already written? How many up-tempos do I have? Do I have too many ballads? Do I have too many up-tempos? What’s missing?And then I have to go into the session the next day and say, ‘Can we kind of write a song like this? I’m missing that kind of a song.’ So it is a lot of constant work. You have to do the prep with the ideas beforehand. You have to go in there open-minded with a whole bunch of ideas and be able to jump onto the idea that your co-writer wants to write and liked of ours. And then you’ve got to be able to block them out as well so you can keep writing fresh things and you don’t keep writing the same song. It’s almost like you need a brain holiday at the end of that five weeks. You have an education in music – you have a Bachelor of Music and you’ve been to the CMAA College and done some other things. Was there anything in your education that prepared you for this exact way of working? With a Bachelor of Music it’s more theory based and sound production and performance, whereas the college course was more tailored to my specific genre of country music, and collaborating, and that’s where I got that introduction to co-writing, which I hadn’t done much of before. So that was a good preparation for me in being able to chart the songs that I’ve written and things like that. But it’s very different over in Nashville – you don’t know how intense it’s going to be until you’ve got that schedule in front of you with double writes. Sometimes you’ve got ten songs to write in a week – and we you don’t really do that when we’re at home because it’s so easy to get distracted with other things you’ve got to do being an artist back home. That’s why I like going to Nashville so much – there’s amazing writers there but it’s also that clean break from being at home. You mentioned that in your red folder you have ideas. The current single, ‘Judgement Day’, did that start out as an idea in the red folder? Most of the time writers expect you to come in with the idea yourself because they want to help you write something that you’re going to relate to, but ‘Judgement Day’ was actually a song that I didn’t write – I would love to have written that one. It was from a lady over in Nashville. I ended up doing a co-write with a guy called John De Algostino and a couple of ladies, and one of the ladies had just gone through a break-up and came out with the first lines of ‘It only hurts when I breathe, I only cry when I’m awake’, and everyone in the room said, ‘Okay, we’ve got to write this song.’ So that was a personal experience from her but it was just one of those songs that when I heard it, it touched me because I think a lot of people – unless you’re very lucky – go through a break-up or two in their lives. It was just one of those real emotional big things, which is what I love about country music, the big power ballads. They’re what got me into country music, your Martina McBrides and Carrie Underwoods, people like that. So as soon as I heard that song it really resonated with me and I wanted to record it, and I got their approval to record that song. The reason why I would have thought you wrote that song is because of the way you sing it – it does sound so personal, and I guess that goes to your long experience as a singer and a performer, taking on someone else’s story. Obviously you have to connect with the song, but is it a process of also feeling that song when you’re recording it? Yes, it’s a very different experience. There’s certain artists who prefer recording to performing live, and others who prefer performing, because it’s completely different. Recording is really intimate – that mic can pick up every little detail of your voice. Whereas performing live you’ve got the natural energy of a crowd, particularly for those up-tempo tracks, they really help you punch those out on stage. I remember recording ‘Judgement Day’, in particular, and just trying to interpret it myself and thinking, This song’s got so much range to it, I need to bring all that to it. I need to have the light, tender moments, those big moments of pain. So there were times when my lips were literally touching the microphone and basically just whispering those words of pain, and then there’s times when I had to let rip and back off the microphone. You have to get a really intimate relationship with that microphone. That’s technique and also knowing your voice, and voices are so susceptible to a whole lot of things, like the weather and what you’ve been eating. Do you do particular things to take care of your voice when you’re going into recording and gearing up for a performance? I used to be very particular about it. I guess the older I get and the longer I’ve been singing, I feel more comfortable with my own voice and know it a lot better than I used to. I used to be really strict and not have anything dairy for a week so I didn’t get blocked up. But now I’m not as strict. As everyone does with diets, you have your little cheat moments, and I’ve done those over the years and then gone, Oh, I can actually still sing through that if I have a milkshake or something.And if you’re singing correctly you should be able to sing through anything. Of course, I don’t try to abuse my voice too much, going out screaming and partying. I try to look after it in that way. But food wise I just like to enjoy what I’m eating [laughs] and as long as I sing correctly I’ll be able to get through it. I suppose there’s also that difficulty when you’re a working performer that occasionally you’ll have a cold or something like that, and you have to sing through it. Has there ever been a performance where you’ve thought, I simply cannot sing today? There’s been a couple of times when I have been very sick. I’ve never – touch wood – completely lost my voice. So it’s just a matter of really warming it up and singing forward and not on my throat. There was one instance in particular that was probably the worst, which was actually recording my debut album. I went up to record in Brisbane, landed off the plane and spoke to my producer: ‘Hi’ [whispery voice]. It was just there. I think I’d done six gigs that week, plus it was winter and I’d got a cold. It was just feeling a bit tired. So I landed at night and had my medication from my producer at his house – he gave me a glass of port and said, ‘Take it to bed’, and I woke up the next morning and he said, ‘How’re you going?’ and I said, ‘It’s a bit better.’ I had another bit of port that morning and kind of cleared the cobwebs away. So we had to work around that and warm my voice up into certain songs. I started out with the ballads, where I needed to be more emotional and have more colours in my voice, and more of those croaks and emotion. And by the time I’d recorded that my voice was more warmed up and more forward and had more projection in it, so I could do more up-tempo tracks. It’s just finding your own way around it and taking a proper warm-up into songs. I’ve digressed from the subject of ‘Judgement Day’ but I will bring us back to it and ask about the video – you did it with The Filmery, a very experienced music video house. As a performer, is it a bit weird to do a music video? I would imagine the song gets chopped up and you have to go over and over those fragments. By the end of the day do you think that it was an extremely strange thing to do? Yes, it is, and I guess particularly at the start of my career and my first couple of videos, that was a very weird thing, to basically have my eyes drilling into the camera and not getting any reaction from the camera, whereas when you’re looking into someone else’s face you get reactions. You feel like everyone else is watching you and you’re thinking, How is this coming across on camera? And you have all these doubts: Am I looking all right on camera? Is it enough? Is it too much? What am I doing? But The Filmery did my very first clip when I was going through that stage and Duncan [Toombs] in particular was great with all that, really encouraging, and I keep going back to them because of that reason. We’ve just got this really comfortable relationship because I know, after doing so many videos with them, that they’re going to tell me the honest truth, and whatever they’re saying, just run with that. And we’ve done so many videos together now it’s pretty comfortable and you get used to the idea that the camera is meant to be your friend, so just treat it as your friend and don’t be scared of it. ‘Judgement Day’ in particular, Josh, who was directing it on his own – I’ve worked with Josh with Duncan before, but never just Josh without Duncan. Josh knew that that was a pretty big thing for me, not having Duncan there, because Duncan was always my comfort blanket [laughs]. But he knew I wanted to do something really special with ‘Judgement Day’ because it is such a big, powerful song, such an emotional song, and I really wanted the story to come across with that. And, of course, I wanted to play the piano, because I’ve never done that in a video clip before, and it’s the instrument I’ve been playing the longest. Before I even sang I was playing piano, but I don’t get to show that side very often because pianos are pretty hard to take around to gigs. I really wanted to put that across, and locations and everything, it all ended up working out beautifully, and I was so proud of what Josh did. He was very easy to work with. Takes any of my input on board. Sat through the edit and there weren’t many changes I wanted but he was so quick doing those little edits. It was beautiful, I was really happy with it. You’ve had a lot happen this year: the album’s come out, you’ve done some tours, you’ve just been in Nashville. Has there been one highlight? That’s a tough question [laughs]. Of course, the hype of the album and the album launch night in particular is a really special one. I had a six-piece band for the launch, which is pretty extravagant, but it was great, because I really wanted to put the album across in the best way. We had a sellout show and special guests come along: Jasmine Rae, Amber Lawrence, Aleyce Simmonds, Melanie Dyer – there was just a whole bunch of artists that were there and supportive, so it was a really great night, seeing all that support from artists as well as the fans who showed up. Of course, touring with Lee [Kernaghan] is always a pleasure and that’s been a lot of fun. But I’d say one of them would be playing at the Bluebird Café when I was over in Nashville, because that wasn’t a planned thing, it just ended up happening. And being a country music fan, we all know about the Bluebird Café and it is so popular now because of the TV show Nashville – it’s so hard to even get into the room. So I’d never actually been inside it and I got asked to be a special guest on one of the shows on a Sunday night while I was over there. Generally I don’t get too nervous but that was pretty nerve wracking. I was enjoying listening to everybody and then I thought, Okay, I’ll just go over my song in my head, go over the lyrics, and I totally blanked out and got struck by panic. I had to reach into my bag to find my album and look through the lyric sheet to remind me what it was. As soon as I got up on stage it was fine, but it was just that moment of, I’m about to perform at the Bluebird – do I know what I’m doing? Should I be here? Okay, yep, cool. It’s such a prestigious place to sing and so hard to get into, I just slightly panicked but it was all fine when I got up there. Loaded is out through ABC Music/Universal. Christie Lamb is already an experienced performer, having been picked by Lee Kernaghan to join his tour in 2015/16. Earlier this year she received a very significant Golden Guitar award, and she’s about to join The Wolfe Brothers and a host of others on the This Crazy Life tour. The first time I interviewed Christie we had a bad phone line – she kindly agreed to answer questions by email instead. This tour is going to be high-energy – are you ready to match the Wolfe Brothers at their own game? Haha! I am used to being on tour with The Wolfe Brothers as we all open, and are part of the band for Lee Kernaghan. We are very good mates and the energy bounces off all of us when we play together, so I’m excited to start the tour. You won CMAA Best New Talent earlier this year – what did that award mean to you and does it bring any pressure? Winning the Golden Guitar ‘Best New Talent’ meant the world to me! It is the highest honour and biggest deal to all country music performers. It was my tenth year at the festival and to receive it from Lee Kernaghan was an absolute dream come true. The only pressure I have is from myself. I am in the process of releasing a new album and as an artist usually does, I would like this one to be bigger than the last! You’ve played to huge crowds at festivals, and you’ve played in clubs and pubs on tours such as that with Aleyce Simmonds and Amber Lawrence. Do you have a preferred size of audience? I think its really hard to beat the vibe of a festival – I love festivals!! Although every size show has its advantages from being intimate and acoustic to a full rocking band. I just try to adjust my set to fit the show venue and size and connect with each audience the best I can. Which do you prefer: performing or recording? And why? I would have to say each of the above is VERY different! I love rocking out with a big band to a festival crowd and feeling the vibe of the crowd, to be honest you can’t beat it. With recording I am always thinking of the emotion of the song and trying to give a good technical performance also, but I do love the results and trying new things and vocally stretching myself. Hearing my songs ‘come to life’ is very special, but seeing people’s reactions live I think wins! What can your This Crazy Life tour audiences look forward to – any new songs? The audience can look forward to a great show with a different taste of country genres from 7 acts, a mini festival of fun modern country. I will be singing a couple of favourites plus something brand new from my upcoming album.